A few weeks ago, Ford launched an influencer outreach campaign in six European countries as part of a build-up to the European launch of its B-MAX car this summer. The car (a mini MPV) features pillar-less doors: there is no traditional central B-pillar which instead is integrated into the doors themselves (video). Easy access to the car’s interior is via sliding rear doors – a feature Ford makes a lot of in its promotional material about the car. The pillar-less sliding doors feature is a central element in the piece of high-tech collateral I received as a benefit of being outreached to, as it were, in Ford’s campaign – a 3D hologram of the car. 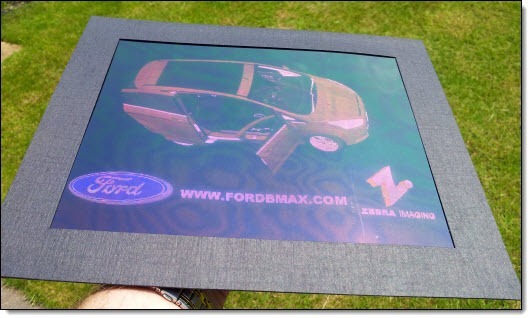 It’s a pretty nifty example of some clever technology by Ford (who designed the 3D data set of the car that was used to create the hologram itself) and by Zebra Imaging, the US company who transformed the 3D data and prepared it for holographic printing. Seeing the actual hologram is the best way to see how all of this works. I have the next-best thing – this video I made earlier today of what it looks like. Vivid 3D images “float” above and below the film plane and can be seen from multiple perspectives simultaneously. Tiny holographic elements (called ‘hogels’) are recorded on the film by lasers and generate hundreds of thousands of points of light. The points of light create a seemingly solid image in space when lighted from above. The company goes into more technical detail on its website about its holographic imaging technology. I like the word ‘hogel’ – it means a three dimensional pixel, says Zebra. Easy to visualize and understand. It’s all a neat idea, one that you can imagine being used in a wide range of marketing and consumer activity, way beyond the military applications for which Zebra Imaging is more recognized. They have some really interesting examples of city mapping in 3D, for instance (and they’re running a contest in this area, closing on June 7). It’s still a technology that requires special settings to get the most out of what you see, though, requiring low ambient light and a special light source to show off the 3D holographic image to best effect. Still, it doesn’t look that bad in direct sunlight as I noted when I unboxed the package when it arrived, although not much 3D about it (hence the requirement for a special light source). So expect to see more examples of three-dimensional holograms like this in brand and product marketing activity especially as the technology and how to use it evolves further. When created and used in imaginative, creative and engaging ways as Ford has done, 3D holograms will likely be highly compelling and become defining elements in the success or otherwise of a given campaign.